The Tho have a population of more than 51,000 inhabitants living in the western part of Nghe An province. Their other names are Keo, Mon, Cuoi, Ho, Tay Poong, Dan Lai and Ly Ha. 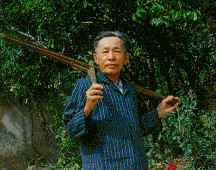 Tho language belongs to the Viet-Muong Group. Formerly, the Tho lived in houses on stilts. But now they prefer houses built on the ground. The Tho do not engage in weaving. 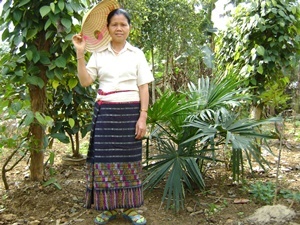 In some regions, Tho attire is in the same way of the Kinh farmers' dress in first half of this century. Tho women also buy skirts from the Thai. As a habit, a square of white cloth serves as female headdress. Mourning ribbon is also a long white piece. In a Tho village, close relationships and mutual help have existed for a very long time. According to ancient custom, land is collecthlely owned by the villagers, whether forests, hills, streams or mountains. Each Tho who is living in the village is free to utilize them to the maximum and to enjoy the fruit of their labour. The Tho young boys and girls enjoy considerable freedom through the custom known as "ngu mar" (literal meaning :women sleeping). They lie and have heart-to-heart talks with each other in a strict manner, of course. In the course of these nocturnal parties, each boy and girl will find their sweetheart. For marriage, the boy's family must spend a lot of money and before the celebration of the wedding, the boy has to work many days for his future parents-in-law. Ancient funerals of the Tho manifested many unique characters. The coffin is a hollowed-out tree trunk and the deceased is buried lying in a direction parallel to the nearest stream. The Tho worship innumerable genies and spirits and the first person who had contributions to clearing land and building the village or a war hero. All families worship their ancestors. Each village has places for worship. Every year, the most important ceremony called "Going to the field" begins a new production cycle, then ceremonies are held for new rice and end of a rice crop. The Tho believe in the existence of man's wits, so when children are ill, a rite worshipping Goddess of childbirth is held and so is a rite held for the whorship of the adults' wits, if the laters are ill. In the past, the Tho possessed innumerable proverbs, folk songs, puzzles, ancient tales and child songs. But now these are gradually disappeared.